With the release of the Radeon HD 6850 and Radeon HD 6870 graphics cards, AMD delivers fantastic value for the average PC gamer. If you want great game performance but don't want to spend too much money, you look for a graphics card in the US$150 to $250 range. It appears as though the Radeon HD 6800 cards are set to be the best performers at their respective prices by a considerable margin. The architecture is based on last year's Radeon HD 5800 graphics cards, but the HD 6800 cards also incorporatea host of optimizations such as improved tessellation performance, better video decoding, and more-robust display output options. The leap in performance offered by these cards is often the difference between being able to play games at full settings and having to reduce resolution or detail levels to keep things running smoothly. They're quite energy-efficient, too. Before we dig into the new features that these cards offer, let's take a look at the specs. The main chip architecture is a modified and enhanced version of what we saw in the Radeon HD 5850 and 5870, which used a GPU code-named Cypress (part of the Evergreen family). The new chips use a GPU code-named Barts (the first in the Northern Islands family). The Barts GPU is smaller than Cypress, and is manufactured by TSMC using its 40nm process technology, but it delivers excellent performance. For comparison, we'll include the specs of the less expensive Radeon HD 5770, which is based on the Juniper GPU of the Evergreen family. A quick glance at the numbers shows that the new cards use a GPU that is roughly 30 percent smaller than the Cypress GPU found in the Radeon HD 5850 and 5870, and 50 percent larger than the Juniper GPU found in the 5770. The GPU still has a full 256-bit memory interface and 32 render back-ends. Though there are fewer shader units and texture units, the clock speeds are a lot higher, so actual performance isn't too negatively affected. If all that is Greek to you, here's the takeaway: On paper, the new Radeon HD 6850 looks as though it's going to be a lot faster than the 5770, and the 6870 will nearly equal the performance of somewhat more expensive 5850. At first, the naming of these new Barts-based graphics cards seemed odd to us. The 6870 will be slower than the 5870, and the 6850 will be slower than the 5850. Usually, cards of a new generation in the same series are faster, not slower, than their predecessors. What's more, you'll still be able to buy 5800-series graphics cards for a while, as they occupy shelves alongside less-expensive 6800-series cards. So why the confusing 6800-series moniker, rather than calling these cards the 6750 and 6770? The naming makes sense when you consider three things. 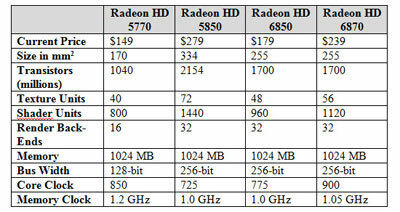 First, the Radeon 5700 series will continue to be produced and sold for some time, occupying the sub-$150 price bracket. Having both the 5700 and a new 6700 series on the market at the same time would be confusing. Second, the new cards are coming in at a price that AMD has historically put the x800 models at (the Radeon 3800 and 4800 models fell between $200 and $300 when they were introduced, while the 5800 series was a high-priced anomaly). Last, the 5800 series may not be long for this world: The next GPU in the 6000 series that AMD will release should displace those cards on the high end.